I saw this fabric with little brown dogs on it at my local fabric store, Five Eighth Seams, and I immediately bought a couple yards knowing it was destined to be a new skirt in my closet. I love how crisp and cool the seersucker feels, and it was easy to make too! I sewed this skirt up using McCall’s 7606 with a few changes. I shortened the entire skirt so it would be calf length instead of maxi length. Also, I incorporated the ruffle at the top into the waistband, so it wouldn’t flap around so much. I used a button closure on the inside top right and a hook and bar closure at the top left, just before the ruffle begins. At the outside edge of the ruffle, I used a small snap. I guess you could say there is no chance of a wardrobe malfunction in this skirt! These closures are way more secure than the ties like the pattern suggests, and I like the security and the sleek look without the bow. The fabric was a little transparent, so I interlined the skirt with white cotton batiste from my stash, and it is the perfect opacity and weight for the skirt. Before I gathered the ruffle, I hemmed it using a narrow roll hem foot. This attachment takes some getting used to, and I have butchered the beginning of many, many hems by unknowingly using this attachment incorrectly until I finally watched this video about using my specific Bernina foot. Though, I am assuming since all of the roll hem feet look the same, this video could be useful if you have another brand of sewing machine. The video instructs to straight stitch the area to be hemmed for a few stitches and then use the long thread tails to position the fabric correctly into the foot before starting to hem. Now, I get perfect hems every time! Instead of cutting out the ruffle the length the pattern suggests and gathering it, I cut longer lengths of fabric, pieced it together in one long strip, and then I used a gathering foot. It is important to have a little extra length of fabric to work when using a gathering foot because it may gather the fabric a little tighter than the way the pattern was designed. Also, you have less control in easing out the fullness if the gathers are too tight. For this skirt, the finished ruffle is about half the length of the original length of fabric. I always like to practice with a scrap piece of the fabric I am working on to make sure the foot is gathering the amount that I want it to. I used a 10 inch long piece of scrap seersucker fabric and made adjustments until my finished ruffle was only 5 inches. Fiddling with the machine settings doesn’t take too long, and I prefer it to pulling basting threads because the gathering foot evenly spaces the gathers for me. After I sewed on the ruffle, I cut off the excess amount of fabric that I had gathered so it was the appropriate length. I also topstitched the bottom of the skirt to hold the seam allowance of the ruffle and skirt bottom in place. I think the topstitching gives the skirt a ready-to-wear look. I paired this skirt with the Nettie Bodysuit I made by Closet Case Patterns. Modifications to the original bodysuit pattern are discussed in this post. This project ended up coming together quickly with the help of my roll hem and gathering presser feet. Do you have any favorite presser feet or sewing machine attachments that help you save time? Let me know in the comments below. I love Barbour-style jackets, but who wants to pay over $300 for a coat that can only be “sponged clean”? I. Just. Can’t. I found this unique, water resistant fabric at Pacific Blue Denims. It is made in the UK at the Dinsmore fabric mill, and is listed as a wax/acrylic coated cotton canvas It is 7 oz and 100% cotton. This fabric is so different from anything I have ever sewn with. It feels dry to the touch, unlike some waxed fabrics that feel slightly sticky, especially when warm. The finish does not rub off when ironed and didn’t leave a residue on my sewing machine either. It has a matte finish, but a beautiful slight sheen (similar to traditional waxed canvas) develops after some use. This wound be a great choice for a dressier raincoat because it doesn’t necessarily look like it would shed water, but it does so wonderfully while also being breathable. Also, the fabric wont have to be re-waxed later. However, there are some drawbacks. The wax/acrylic canvas also has a very stiff drape that makes gathering and easing tremendously difficult. While I was setting in the sleeves, I kept thinking the fabric behaved more like brown craft paper rather than canvas. Oh, and perhaps the biggest challenge working with this fabric is that needle marks are hard to remove. Much like working with leather, all topstitching much be perfect on the first try. No do-overs! Drawbacks aside, I think this is a wonderfully made, hard-wearing fabric if you are looking for a new kind of challenging material to sew with. I used a brown faux suede at the front yoke that I quilted to the coated canvas with some matching machine quilting thread. I used this same brown thread for all the topstitching elsewhere on the jacket. 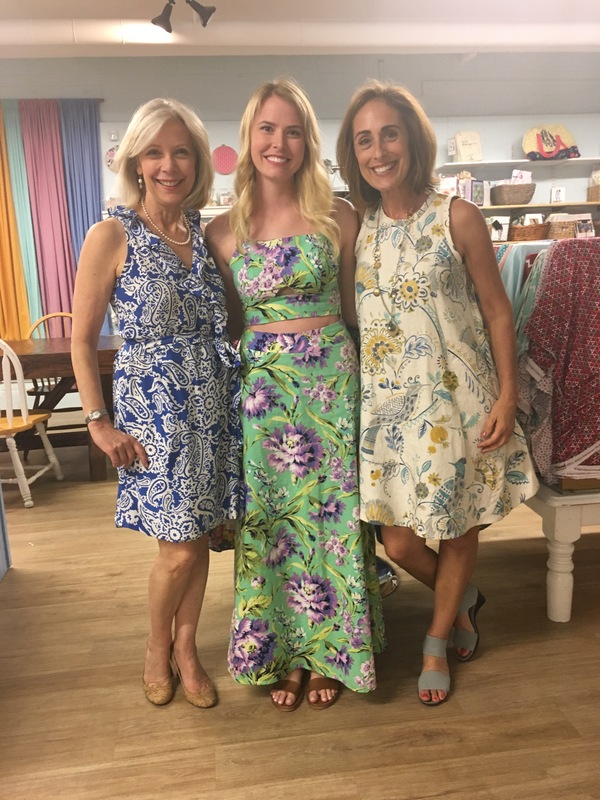 The interlining fame from Five Eighth Seams, a local fabric store in Charleston. The zipper is an M6 Riri zipper from pacific trimming that I had to dye darker with synthetic dye. Snaps and other hardware were from the Closet Case Patterns Kelly Hardware kit. I used the Kelly Anorak Pattern by Closet Case Patterns (size 4). 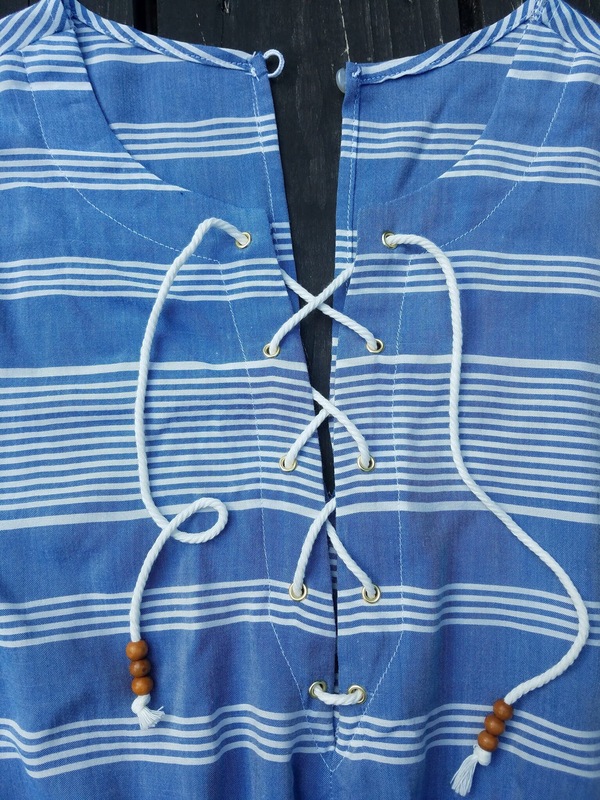 Modifications are as follows: Lowered the drawstring by 3/4″, moved the drawstring to the inside, changed pockets to have a flap closure, added an interlining, quilted the front yolk pieces, lengthened the sleeves by 1/4″, and made a broad shoulder adjustment. I am thinking about making a detachable, snap-on hood by modifying the Kelly Anorak hood pattern pieces. I don’t use hoods on jackets, but it would be good to have on a rainy day. What do you think? Would you ever sew with traditional waxed canvas or wax/acrylic coated canvas? This romper was almost a sewing fail. It took me nearly twice as long to finish as it should have because I mistakenly made two right pants legs and spent hours unpicking seams. The right and wrong sides of this fabric are identical, so I should have marked the wrong side with water-soluble pen. I used chalk on this light-colored fabric, but it wore off too soon. 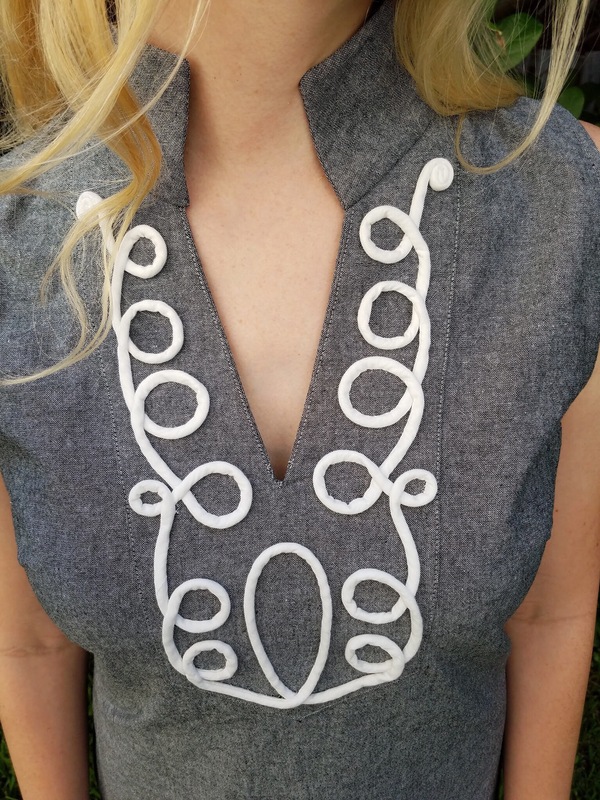 The fabric came from Indie Sew, and it is a lightweight rayon chambray. It had a few imperfections scattered throughout the yardage (some of which I accidentally included in my romper). The fabric is very soft and drapey, which is typical of rayon fabrics, but this fabric is particularly shift-y. I had trouble matching some of the stripes because of this. I think this pattern design benefits from a fabric that drapes well to eliminate bulk around the gathered waist, but maybe I should have chosen a thicker rayon challis or tencel fabric. 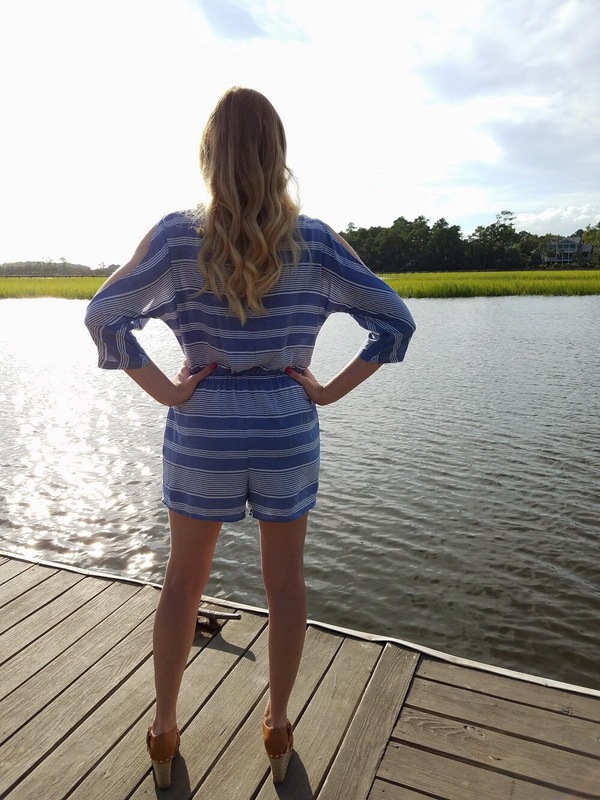 I used Very Easy Vogue 9260 to make this romper, but I think I would rate this pattern’s difficulty as “easy” instead of “very easy”. There was A LOT of narrow hemming required to make this, so don’t expect to complete this as quickly as other very easy vogue patterns. The neckline and the cold shoulder cut-outs in the sleeves are all finished with a narrow hem as opposed to facings which do require a little more patience, but they give a more professional appearance. I made a size 8 even though I am usually a 10 in Vogue patterns. I read other reviews that this style ran big and they were right! The finished measurements listed on the pattern indicated the 10 would have been massive. I chose to modify the front lace up closure and use grommets instead of fabric loops. I thought the grommets would take less time and look less handmade. I also topstitched the fabric to the facing to keep the facing from shifting, and used a thread chain for the back button loop. 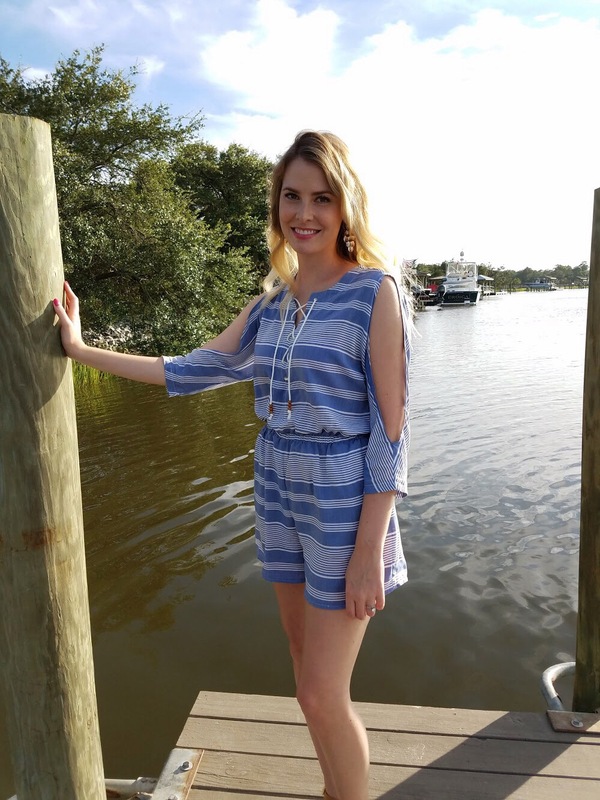 It is still quite warm here in Charleston, and I have a few other summer projects lined up before I start making my fall wardrobe! What is on your fall “must sew” list? Since it is currently Me Made May 2017, I have a brand new outfit to share! It’s made up of a Closet Case Nettie Bodysuit with a few hacks and a maxi skirt made with a Burda pattern. The skirt is made with the “Train Maxi Skirt 09/2014 #105” by Burda. The only modification was to cut the train off at the end. It was so beautiful, but not practical at all. This skirt pattern was drafted in a very interesting way, and it is unlike any skirt I’ve ever seen. There are two very long front darts that extend down to the knee, and there are no side seams. There are only the middle back and side back seams. From the front, the skirt looks like a maxi with a straight silhouette, but the back is very voluminous. I used a floral rayon challis from fabric.com that I purchased last year. It’s important to choose a lightweight drapey fabric for this skirt since there are no side seams, and the fabric has to flow over the hips. For the neckline of the bodysuit, I used this tutorial posted by Heather Lou on the Closet Case blog to hack the nettie into an off the shoulder bodysuit. 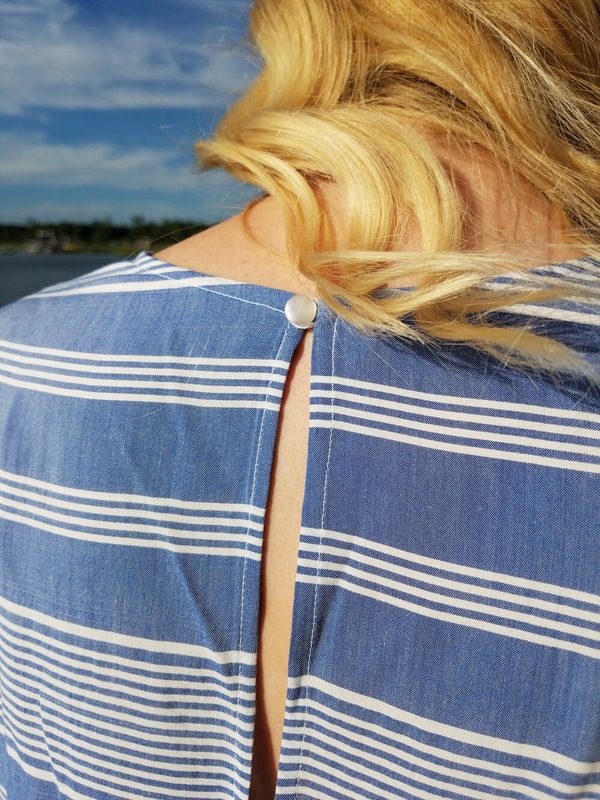 Instead of using a knit band at the neckline like Heather Lou did, I stitched 1/4 inch elastic to the wrong side of the neckline edge with a zig-zag stitch without stretching the elastic or the fabric. Then, I folded the elastic under to the wrong side and used a wide cover stitch stitching through all thicknesses. If you don’t have a coverstitch machine, you can use a wide zig-zag stitch for that part too. To make the ruffles for the sleeves, I drafted ruffles that resemble 3/4 of a circle in two different lengths for each sleeve. The ruffles are sewn on with a zig-zag stitch just above the sleeve hem. The fabric for the bodysuit is the white kaufman laguna stretch jersey. It is a spandex cotton blend and has great recovery. I have used this jersey in many colorways, and it is my favorite jersey to work with. It is so soft yet substantial, and it is easy to sew with. The white was a tad sheer, but the other colors/ colorways I have used before have not been. To account for the sheerness, I made the nettie two sizes bigger, and this seemed to help. Have you done any pattern hacks lately? I’d love to know! I’m a little late posting my #sewmystyle April creation. Earlier this month, I went to Las Vegas with nine other girls for a bachelorette weekend celebrating my friend and the bride-to-be, Brittney. I think it is safe to say we all had the time of our lives! I managed to take some pictures of my dress while lounging at one of the pools at the Venetian. 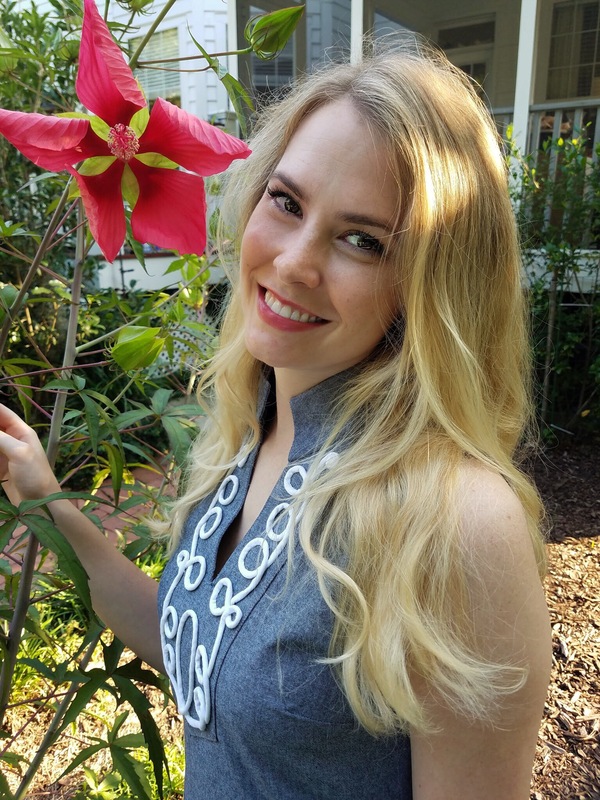 This month, the #sewmystyle pattern is the Bridgetown Backless Dress by Sew House Seven. 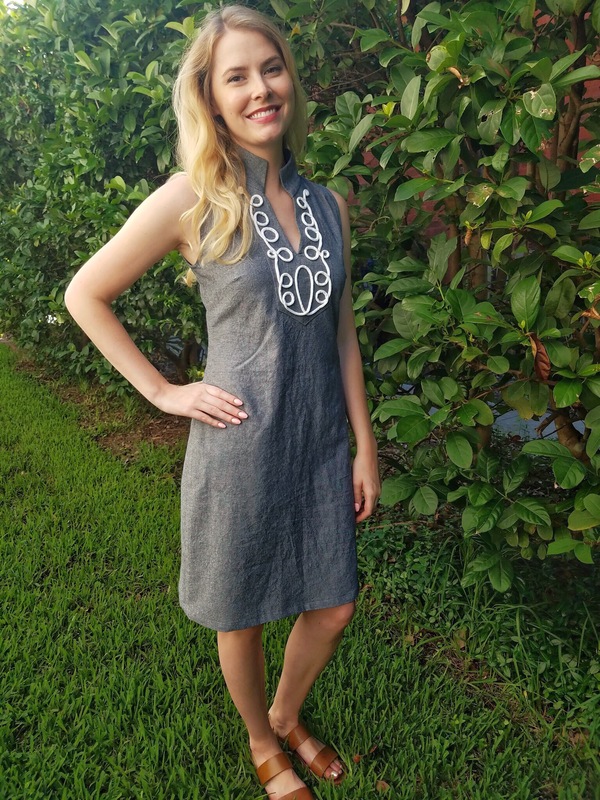 The pattern is easy to sew, and I made this dress in only one full day. This would be a great dress for a beginner as there are no set-in sleeves, zippers or difficult closures on this dress. I made a size 2. Looking at the photo on the pattern envelope, the dress appears to have plenty of wearing ease. However, I didn’t look at the finished hip circumference before cutting. While the bust is loose and drapey, the hip area is pretty fitted, and I would be more comfortable if I had graded the hip area to a size 4. 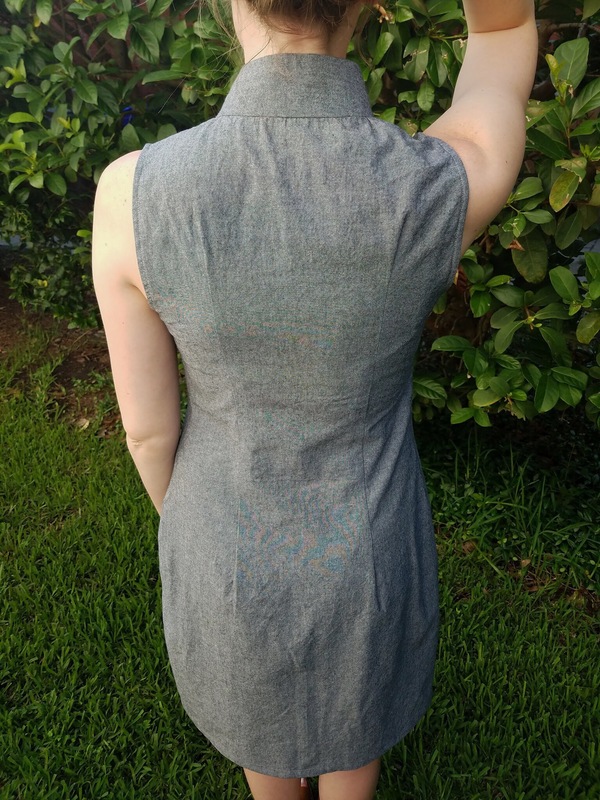 I made this Bridgetown Backless Dress by Sew House Seven out of a polyester crepe de chine fabric I was hoarding with the intention of making a wearable muslin I could use as a swim cover-up. Crepe de chine is very thin, and works well for lining garments or light blouses. It works fine for a swim cover-up as the fabric is lightweight and not too hot in 90 degree weather, but I have to be careful to not sit on any rough surfaces that could pick the fabric. So, I would suggest picking a more substantial fabric if you make this pattern. On a side note, I recently bought a coverstitch machine, and I’ve been learning how to use it. I bought a Bernina L220!! I hope to write a post about it soon, but I want to use it a little more before I write a full review.